The first mini on the blog in a while! This was a 'quick and done' type of paint-job, intended to fit with my BMG minis, but not taking ages to complete. I was talking with main gaming buddy Rob a few days ago about not getting much done and painting a couple of quite fiddly minis recently, so he suggested doing something easy like a dog. While I had a couple of things in mind, my first thought was this mini, since it would require a relatively simple colour palette, was a one-piece cast (quick to get ready), and was a change from the recent focus on Anima Tactics minis. This was prepped and undercoated the probably took around 2-3 hours of painting in 3 sessions over 2 days. I am happy with the outcome for (for me) such a short turnaround. 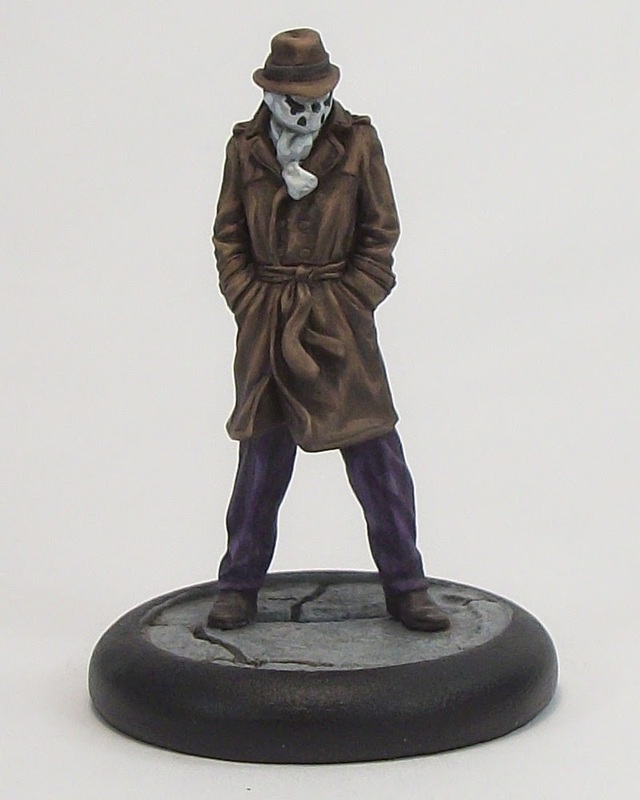 The mini is simple enough and nicely evokes Rorschach, although hands in pocket seems a cop-out sculpting wise, since he could have had arms out ready for a fight, and the drapery on the trousers could have been a lot better I think. 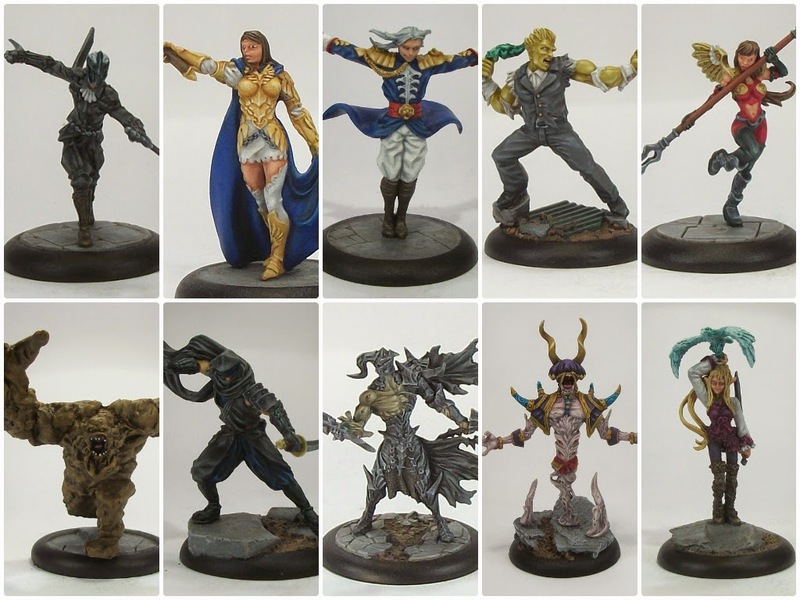 So far I have painted stuff in very random order for BMG, and this is no exception. I suspect it will be a while before I get a Crew together. 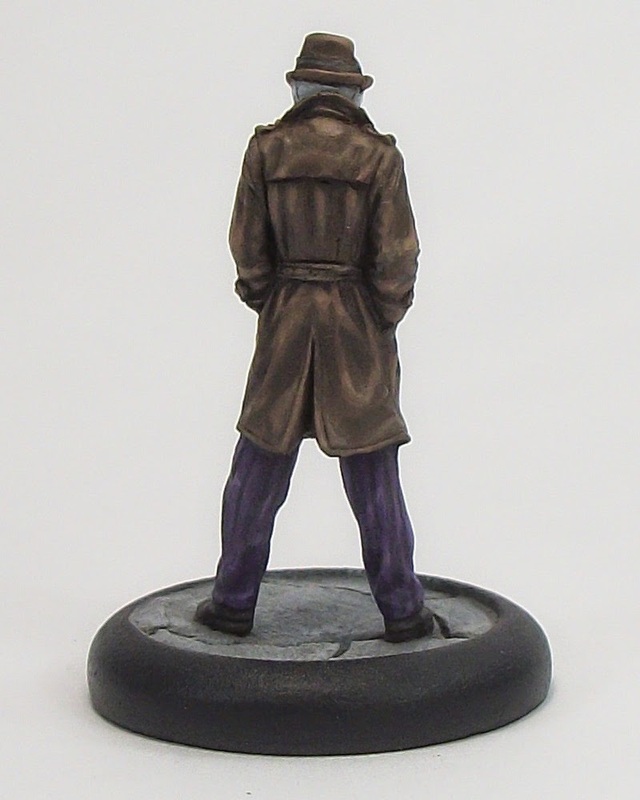 Although I love the Watchmen minis, so that could be the first Crew I finish possibly. I am still a long way off playing the game, and I hope that Knight Models produce a printed rule book (preferably hardback), and that they rethink their game cards. The game cards are an unwieldy size I feel, and do not fit any typical game card sleeves. Worse still, the trimming of some leaves them larger than the standard KM size, meaning they are bent when used for packaging, not a good thing when paying a premium price for a mini in my opinion.Small criticisms, but relevant ones I think. Well, I almost forgot about the Quarter 2 painting summary! 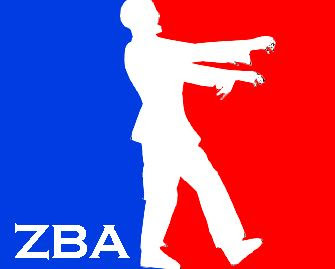 Better late than never I say! It looks like I will be lucky to manage 40 minis this year, which with my coursework workload is 'okay' although I would rather paint more. May was a poor month, with just one mini painted.